If you're ever flying in to the Sodankylä Geophysical Observatory (SGO), there is a reasonable chance that you'll actually land at Rovaniemi and then drive the rest of the way. 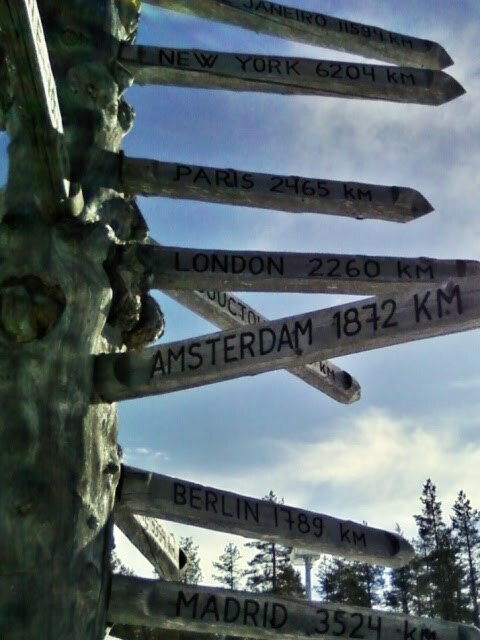 Rovaniemi is a town that lies more-or-less on the Arctic Circle itself. There is a small dual-use airport there and it is a popular gateway for tourists who visit Lapland. Just outside the entrance to the airport is a huge timber sign. 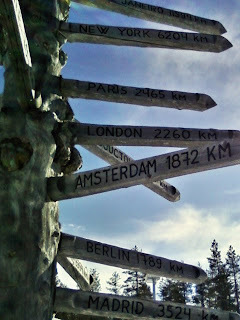 Made from the trunk of a dead tree, the 'branches' are signposts pointing in the directions of various major cities of the world and indicating the distances to them. Nançay, Chilbolton, Exloo, Potsdam... and all the other LOFAR stations! Hmm... maybe we need a sign like that at the KAIRA site?